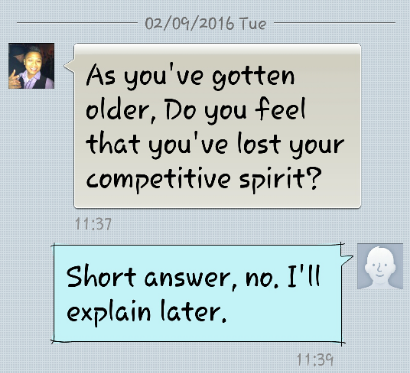 Two weeks ago, my cuzo Dex randomly texted me if I lost my competitive spirit. After a bit of analyzing, I said no. See above photo. And now, I’ll explain and recap what we discussed and add my own insights to the equation. This text was sent days after Super Bowl 50. Funny thing tho is that thoughts of sportsmanship, competitiveness and losing were then floating in my head and actually prompted me to write a slice. Super Bowl 50 was only ok since both teams were highly defensive. Twas more like a regular season game. in the mindset to compete. For the record, when I do win, I tend to revel in silence. Those that do make it known that they win are a bit annoying. Y’all know who you are. Don’t do that. We know you won and we lost. We get it. Ha! I’ve noticed nowadays that people are worse poor sports than ever before. For those that don’t know, a poor sport is someone who loses in a bad manner. Think of a whiny kid or an angry bird. But of course, it’s natural; no one likes to lose, or I hope not. I don’t wanna point any fingers, but I will anyway. Media is what makes us think that we are all winners. I write this part as I sit in my car in SF and a whino passes by singing, I Believe I Can Fly by R. Kelly. Lol. It’s awesome to believe you can achieve anything. But in reality, it’s seriously dangerous ground. Why? That kind of thinking sets high expectations for us all, especially for our youth. When we don’t reach our goals or win, our realities come to a crashing halt. That leads to disappointment and devastating heartbreak. For example, many tears were shed and egos crushed during the years at American Idol auditions all because they thought they had what it takes. I’m not talking about those that could actually sing, but those who make our skin crawl with their unnatural singing inability. Not everyone is destined to win all the time and many of us unfortunately don’t learn that lesson. Or better yet, we don’t instill it in our heads like we do with winning. Instead, we learn by eye-opening defeat. Even champions lose at some point. Take Ronda Rousey for instance. She was once undefeated and got served a huge slice of humble pie with an unforgettable knock out. If you haven’t seen recently, she cried about her defeat on TV. Even grown men cry too when they lose championships. I get that. Many people wanna be the best, but instead of sulking about it, work harder to be the best. It’s not about losing, it’s about what you do after you lose. I learned this lesson at a young age. In fact, it was in fifth grade. Being the nerd that I am, I loved joining the spelling bee. In my class, it was down to me and this girl. From my recollection, she misspelled deactivate and I thought I had won. But the teacher gave her another chance, due to what I believe was the race card (not saying the ethnicity publicly), and I was thrown off my game and eventually lost. I never cried so badly about losing before. Did I quit? No. But I learned that losing aka failure is a part of growing up. And in seventh grade, I won second place in the entire school, losing to a simple word – atrophy. It’s only because I never heard of that word then. Some people don’t learn that lesson until they hit rock bottom. From my experience, if y’all ain’t playing sports or games or competing in anything, y’all have no reason to worry about winning or losing with anyone else except yourself. You will forever be your own biggest competitor. Whatever your situation is now, there will be people worse off than you and there will be as many people better than you. All you should focus on is being a better person than you were yesterday. I believe you nailed it Ryan. As young as you are, you are destined to be a brilliant writer. You have a long way to go. Focus on whatever road you wanna take. Then you really have to work for it. It’s the key to life success. That reminds me when my father, that is your Uncle, he was a very successful insurance man. He was a top grosser in the North Bay Area, he’s got visitors riding in a limousine, he gave me a book. Xerxes. its a book that mainly teaches a person to gain positive mental attitude and eventually achieves his goal and success. The essence of the book is to be competitive, independent and tons of hard work in whatever passions that you believe you excel. Then and only then you would become a success. So far you’re doing good so keep it up. Be on the right track, it don’t matter if you lose your way now and then, the main thing is you get back on track. If you fall, it’s only an episode, get up. Good luck Ryan, you’ve got what it takes. Thanks for the kind and inspirational words! I’m curious to read Xerxes. Do you have it with you? Otherwise, I can search for it. I appreciate the recommendation. Hi Ryan, Sorry I don’t have it anymore. I gave it to Chantelle when he came visit us right after she got married. My Dad gave that book to me. I don’t know if Prudential Insurance gave it to him. Anyway, it wasn’t really a book, it’s a binder probably a compilation of pertinent information that focuses on how to achieve your goals and be successful. Self motivation and building up your resources, stuff like that. I’m sure you can find it, what you’re looking for. Good luck again.